Product #18538 | SKU DR44WL | 4.5 (based on 2 ratings) Thanks for your rating! 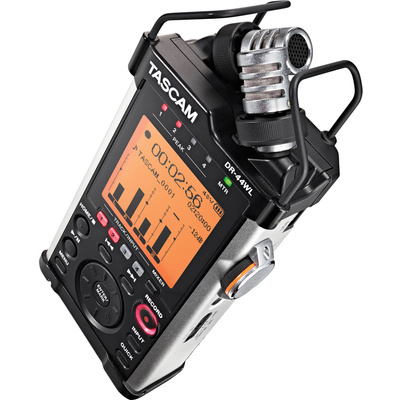 TASCAM's DR-44WL is a fully professional portable recorder that is great for recording rehearsals, sound for video, or any other applications utilizing newly-upgraded high-resolution, 96kHz/24-bit converters. The DR-44WL's built-in microphones feature improved shockmounting and are arranged in a close XY pattern, providing you with an effortless stereo image with no mic-placement hassles. The DR-44WL is also a capable 4-track recorder, allowing your arrangements to be recorded one track at a time with reverb. On top of that, the DR-44WL's innovative new features allow you to conveniently transfer and stream files, as well as control the DR-44WL's transport with your smartphone or computer over Wi-Fi. Built-in microphones deliver an effortless stereo imageThe TASCAM DR-44WL portable recorder includes a set of shockmounted stereo condenser microphones, arranged in a close XY pattern for a perfect stereo image. Since you won't have to hassle with mic placement, you'll never miss an important moment. Nonetheless, the DR-44WL does feature a pair of XLR inputs with phantom power for projects that require more elaborate microphone setups. Able to withstand up to 132dB SPL, the DR-44WL can handle loud sources without breaking a sweat. And everything is captured with pristine AD/DA converters at up to 96kHz/24-bit resolution. Innovative Wi-Fi connectivity provides convenience and enhanced operationIf you want to record something but aren't a part of the action, then you can control the TASCAM DR-44WL portable recorder over Wi-Fi using your smartphone or computer. You can also conveniently transfer and stream files over a wireless network instead of fidgeting with a USB cable. Imagine being able to instantly share your recordings online or upload them to the cloud without even touching your recorder. No other portable recorder on the market has this game-changing feature! The DR-44WL is compatible with Mac and PC, as well as Android and iOS devices. Multitrack mode allows you to record your arrangements one track at a time On-the-go Multitrack Recording Multitrack mode with reverb for on-the-go 4-track recordingsPerfect for capturing on-the-go musical ideas, the TASCAM DR-44WL portable recorder's multitrack mode allows you to record your arrangements one track at a time. A surprisingly lush reverb can also be added to your tracks. You can also record four channels at once for quick band recordings or use the DR-44WL's dual recording mode for creating a safety track in case your levels get too hot. If you're shooting video, the DR-44WL provides you with a hot shoe-mount and a stable internal clock to avoid drifting out of sync with your camera. Very fast delivery and friendly customer services. The device is worth the price and shipped in nice packaged box no damage at all.